Learning about Pumpkins with your Preschool or Kindergarten class. 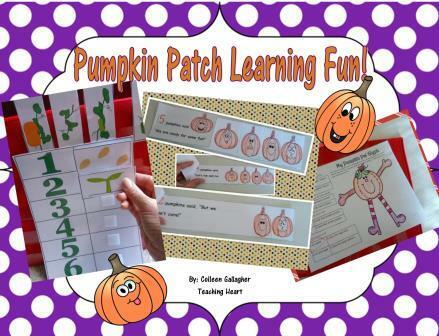 Little books, pocket chart pieces, and more for learning fun at the Pumpkin Patch! Page 6. Five Little Pumpkin Manupulatives to use to retell the poem found on page 7. Page 7. Five Little Pumpkins Poem with coloring page. Page 8 and 9. Five Little Pumpkins Counting Flap Book. Students color and trace. Page 10. Counting Puzzle to print. Page 13. Number writing and one to three worksheet. Page 15 and 16. Pumpkin Sequencing Pocket Chart Pieces to use when teaching about the pumpkin life cycle. Page 17 and 18. Pumpkin Sequencing activity. Students sequence the cycle in order. Page 20 . Pumpkin Life Cycle Mini Book for students to color. Page 21 and 22. Once I Planted a Pumpkin Seed Mini Book. Students Color and Trace and bring home to share and read. Page 23. Pumpkin Pals Glyph Activity. Page 24. Pumpkin cut and paste 10 frames worksheet. Page 25 26 and 27. Pumpkin Rhyming activities. Pages 29 and 30. Pumpkin Themed Play-dough Mats. Page 31. Five Pumpkins on a Gate Dice Game. Have students take turns rolling the dice and matching the picture to the number rolled. First person to roll the gate and five pumpkins, wins! Page 32. Square Pumpkin Counting Puzzles one to six. Page 34 and 35. Life Cycle Sequence Puzzles one to six. Great for an independent center. Page 36. Beginning Sound Pumpkin Patch Match Up—Students match the pumpkin Page 37 to the picture that matches the beginning sound Page 36. Student covers the picture with the pumpkin letter. When finished the patch is filled with pumpkins.